Never Go Back opens on the aftermath of a brawl. Reacher sits bruised and unfazed at the counter inside a restaurant. The men who dared to mess with him are scattered outside, clearly the losers of a fight. We know that Reacher is able to more than hold his own in an argument and the scene introduces Reacher’s character… an ex army major, a drifter, and a man who is not afraid to take down corruption, regardless of the cost or risks to himself. We know Reacher is a man of action even if we don’t see it for the vast majority of the movie, which is its fatal flaw. Fortunately, the film has an interesting premise and a great supporting cast. What happens if a loner is suddenly no longer alone? 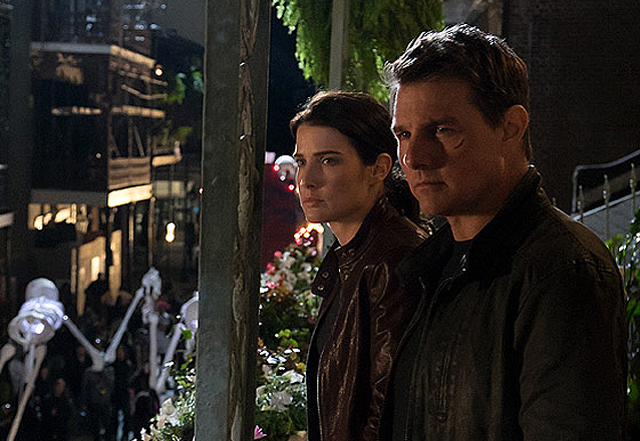 In this installment, Reacher travels to Washington, D.C., on a whim to meet a woman he’s been corresponding with during his travels…Major Susan Turner (Cobie Smulders). When he arrives, he discovers that Major Turner is in prison awaiting trial and has left strict orders for Reacher not to contact her. And if that isn’t bad enough, Reacher is also told that he may be a father to a troubled teen daughter, Samantha (Danika Yarosh). Smulders was a smart choice for Turner. Audiences like her in the action role and she has enough charisma to hold her own onscreen when playing opposite Cruise. Other smart casting choices include villains Patrick Heusinger and Robert Knepper (Prison Break). Zweck spends the vast majority of the film on character development and dialogue and seems to miss the fact that an action movie should be focused on action. I’m in favor of a slow burn, but the payoff in this film is not worth the wait. This entry was posted on Friday, October 21st, 2016 at 9:18 am	and is filed under Film, News. You can follow any responses to this entry through the RSS 2.0 feed. You can skip to the end and leave a response. Pinging is currently not allowed. « Film Review: ‘American Pastoral’! !